Make sure the calcium supplement you take passed our review and is right for you! Isn't your health worth it? Confused about calcium? With so many different forms, dosages and ingredient combinations (such as calcium with vitamin D or magnesium) available, it may be hard to know which product is best for you and your family. ConsumerLab.com's new review can help you choose the highest quality calcium supplement at the best value! Calcium is critical for building and maintaining strong bones and preventing osteoporosis. It is also needed for the proper functioning of nerves, muscles, glands, and the cardiovascular system. But you need to be careful! 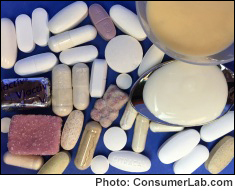 Getting too much calcium from supplements can your risk of heart attack and kidney stones. ConsumerLab.com tests found problems with some combination products — including one which failed to properly disintegrate in the allotted time, and another which contained less magnesium than claimed and was contaminated with lead. Fortunately, however, we also found a number of quality products which passed our tests and provide a reasonable dose of calcium -- some of which cost less than 5 cents per day. You must become a ConsumerLab.com member to get the full test results for calcium supplements, including quality ratings and CL's Top Picks. You will get results for 28 calcium supplements: 18 selected for testing by ConsumerLab.com and 10 others that passed the same tests through CL's voluntary Quality Certification Program as well as information about three supplements similar to ones that passed testing.